A deep respect for and understanding of the natural world is woven into our history, curriculum, and values at Athenian. Athenian students demonstrate care for the natural environment and an awareness of proven problems to take an active role in tackling environmental issues. Environmental stewardship has been a core value here since we opened in 1965. As an active member of the Green Schools Alliance and the Contra Costa Business Program, our students learn how to steward the environment. Middle School Focus Days:﻿ Beach cleanups, Mt. 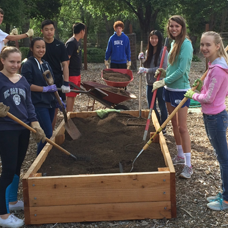 Diablo community service projects, maintaining the Middle School Sensory Garden. Garden Projects: ﻿Athenian's organic kitchen garden is a showcase for sustainability and features a student-run Earth Tub composting system, drought-tolerant drip irrigation, and a chicken coop. Athenian is also home to a permaculture garden, a sensory garden, and a 120 tree fruit orchard. Electric Car Project: ﻿Students have been working for the last several years to convert a gas vehicle into an electric car. Perched on the hillside above the baseball fields is a solar array in the shape of an "A" that provides more than 70% of Athenian's electricity needs. In addition, solar panels that heat the pool are installed on the roof of the gym, and solar panels on the roof of the Dase Center and the Center for the Arts provide electricity for those buildings. Track the Solar A’s daily production (ID = athenian; password = owls.) Track the Dase Center's and CFTA's daily energy use. Nearly 60% of Athenian's hauled waste is recycled content. About 10% of previously hauled waste is composted. Students participate in campus-wide recycling efforts and recycling bins are paired with landfill bins all across the campus. Nearly two million gallons of water have been saved annually with the installation of the Estakhri Family Sports Field, an all-weather field with recycled infill. In addition, water-saving plumbing fixtures, micro water heaters and landscaping policies add to the School's commitment to reduce water usage. ﻿Athenian is a member of the Green Schools Alliance, a consortium of public and private schools working together to conserve resources and reduce greenhouse emissions, and is also a full-credited member of the Contra Costa Green Business Program. Athenian earned Acterra's 2013 Business Environmental Award for Sustainability. Read the press release. Athenian was named a Green Ribbon School by the U.S. Department of Education in April, 2012. Read the press release. The Athenian School won the the Best in Show: Contra Costa Eco-Award from Diablo Magazine in March, 2012. The award is given to schools that lead the way in the green revolution. "One of the ideological pillars Athenian was founded upon in 1965 was environmental stewardship, and nearly all of the Danville school’s 463 students get involved with an eco-friendly project of one kind or another—whether that’s converting a teacher’s old beat-up Honda into an electric car; creating biodiesel in the science labs, with the goal of converting the school’s buses to Willie Nelson’s favorite fuel; making the campus more water-efficient by putting in perennial plants that require less water and improving catchment; or working with the school’s organic garden and its two-ton capacity composter. If the curricular and student-led efforts weren’t enough, Athenian also partnered with Tioga Energy and RCA Solar to install an array of solar panels (in the shape of an A) on campus. The panels now provide more than 60 percent of Athenian’s power. And almost 60% of the school’s hauled waste gets recycled. The school has been certified by the Contra Costa Green Business Program—no surprise, given the way green seems to flow through Athenian’s veins. Athenian has been named a Green Power Partner by the Environmental Protection Agency in recognition of our efforts to reduce the risk of climate change through green power purchasing. In 2009 and 2010, Athenian won the Waste Reduction Award from the California Department of Resources Recycling and Recovery (CalRecycle) for improving the environment by reducing landfill waste. Athenian won the School of the Year awarded by Sustainable Contra Costa on September 29, 2010. In 2009, Athenian was the recipient of a grant from the Alliance for Climate Education to implement various green programs, such as converting a car from gas to electric. In June 2010, The Athenian School received an Adopt A Garden Grant from Sloat Garden Center in Danville for use in the permaculture garden.